Folate contributes to maternal tissue growth during pregnancy. Folate contributes to normal amino acid synthesis. Folate contributes to normal blood formation. Folate contributes to normal homocysteine metabolism. Folate has a role in the process of cell division. Contents: 90 VegeCaps containing 600µg 5-MTHF folic acid each. Folic acid is a general term for a group of water-soluble B-vitamins, and is also known as vitamin B9. Folic acid is a purely synthetic compound that does not exist as such in nature. Folate is the natural form that can be found in foods. The most important metabolite in the human body, making up to more than 90%, is 5-MethylTetraHydroFolate (5-MTHF). The body must convert the synthetic folic acid into its biologically active form 5-MTHF by using an enzyme called Methylenetetrahydrofolate Reductase (MTHFR). Only this enzyme allows the body to convert folic acid into the natural folate 5-MTHF. Unfortunately, this enzyme does not work equally in all people. The consequence is that the synthetic folic acid is significantly badly converted to the natural metabolite. This is a very common problem, which affects about 50% of all women in Central Europe. What are the consequences of folate deficiency? Folate deficiency results in disrupted cell division and growth processes. As a result, folate deficiency may lead to anemia. In pregnancy to an increased risk of congenital malformations NTDs (neural tube defects) affecting the brain and / or spinal cord of the unborn child. The most known is Spina Bifida (Latin: "split spine") (Source: German Nutrition Society). What is the recommended intake of folate equivalents? The recommended intake of folate equivalents depends on a person's age. For adolescents and adults it is 300 µg (micrograms) per day. Pregnant and lactating women have an increased requirement, so the recommended intake for pregnant women is 550 µg of folate equivalents per day; 450 µg per day for women who are breastfeeding (Source: German Nutrition Society). Why should women who want to become pregnant and women in the first trimester of pregnancy take additional folic acid? Neural tube defects (NTDs) are a group of conditions in which are openings in the spinal cord or brain that remain from early in human development. In the 3rd week of pregnancy called gastrulation, specialized cells on the dorsal side of the embryo begin to change shape and form the neural tube. When the neural tube does not close completely, an NTD develops. A fetus’s neural tube should usually close during the first 4 weeks of pregnancy. An inadequate supply of folate during this critical phase increases the risk of NTD. There are various causes of neural tube defects, but studies have shown that such defects can be reduced by taking folic acid supplements. 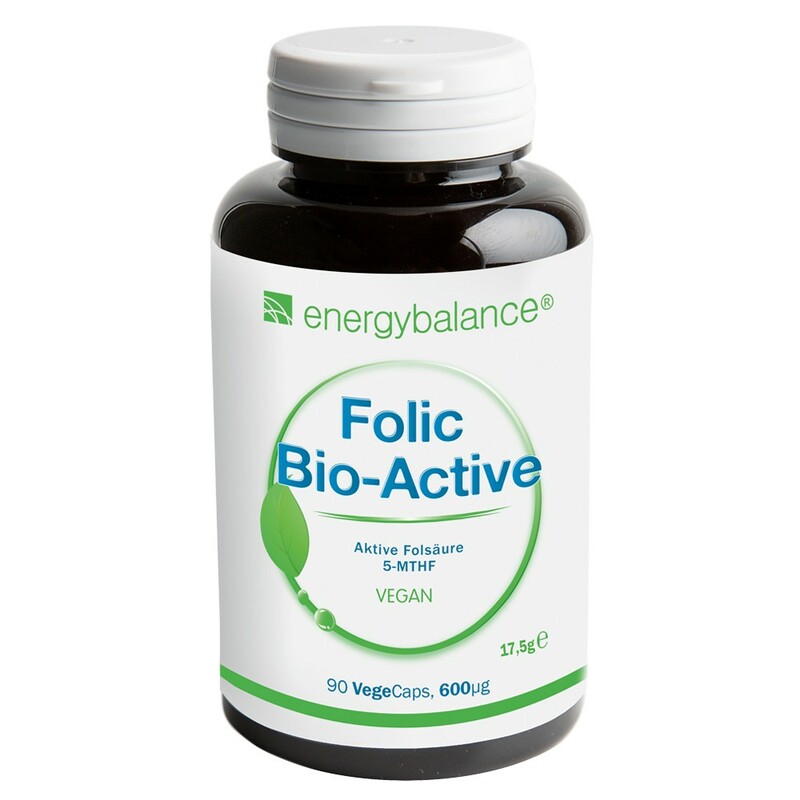 Women should start to take the folic acid supplements 4 weeks before the beginning of pregnancy. Since many pregnancies are not planned , many women do not know that they are pregnant and therefore should take min. 500 µg folic acid preventive per day in addition to a folate-rich diet, in order to avoid NTDs. In any case, a folic acid supplement should be taken during the first trimester of pregnancy (Source: German Nutrition Society). Foods enriched with folic acid or supplements? Regardless of folate intake through their diet, pregnant women during the first trimester of pregnancy and women who want to or could become pregnant are more save when they take a food supplement that contains 500 µg of folic acid. It is the best way to ensure the quantity of 500 µg, than eating enriched foods, where the quantity of folic acid is more difficult to measure. The folate compound 5-MTHF is the same as the body's own biologically active form of folate. EnergyBalance™ Folate contains no artificial colors, preservatives, gluten or lactose. Vegan. 5-Methyl-THF from [6S]-5-methyltetrahydrofolic acid, cellulose (VegeCaps). Interesting study about 5-MTHF: Page 13.